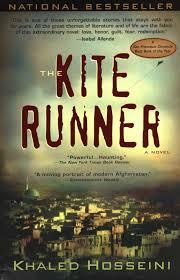 A Sad Story Of A Pashtun & A Hazara : Two Brothers – Betrayal & Redemption @ “The Kite Runner” By Khaled Hosseini. I have never come across any novels I have read that make my eyes water (I am not a romantic or soap opera lovey-dovey novel aficionado) like “The Kite Runner”. I’ve noticed the novel since 10 years ago I guess when I saw it in my friend, Naz’s bookshelf in USM. And then I saw the novel again in my sister’s bookshelf in Putrajaya. Nevertheless, I paid no heed; until now. Took the book just to fill the gap before I commence reading Tun Dr. Mahathir’s thick “Doctor In The House” (hey, wait! I should be concentrating on my research! Darn! Haha!) AND I couldn’t put it down! The momentum of the story was extraordinarily embroidered in such an intricate but enticing manner throughout the entire novel! All I can say, I am nailed to this novel. The author, Dr. Khaled Hosseini. Quite a dashing man and intelligent, isn’t he? Haha! The novel is a hybrid of every elements that could make a good novel. Bits of historical facts, cultures, religion and of course, excruciating pains of the characters are able to sink the readers with endless heart-wrenching emotions. 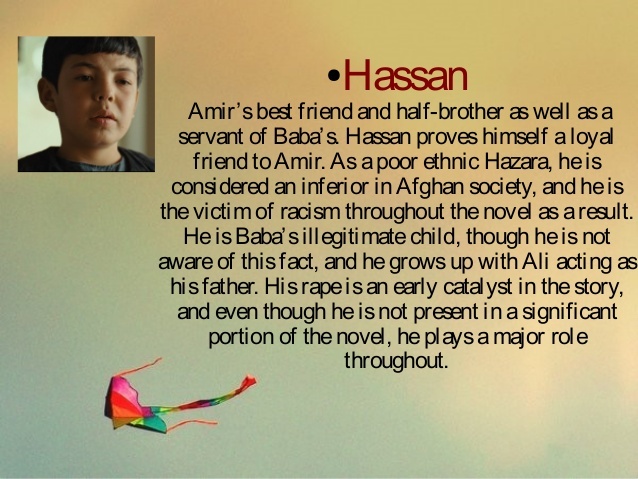 The novel centers upon the friendship of two boys namely Amir and his boy-servant Hasan who grew up in the same house. Amir was a Pashtun, an ethnic that was highly regarded in Afghan society and he was also a royal-blooded whereas Hasan was a Hazara, an ethnic with Mongolese features and often ridiculed in the Afghan society – often affiliated with middle and low class professions and hierarchy in the society. Amir and Hasan. 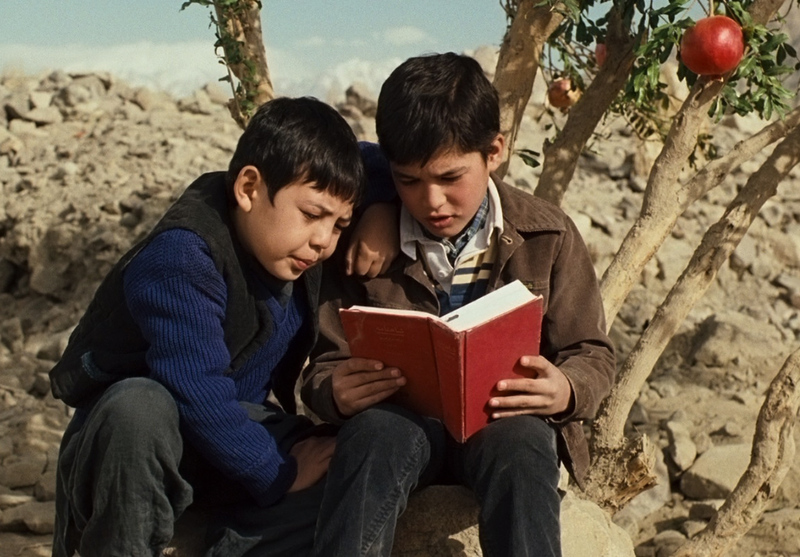 Amir is reading book to the illiterate Hasan. I have never seen the film version but from the snippets and reviews, the boys who portrayed Amir and Hasan seemingly did good jobs. Although both always hanged out together, Amir regarded Hasan no more than his servant and the selfishness grew into hatred when it seemed that Amir’s father always favoured Hasan and included him in any of the family’s activities. It came to a boiling point when Amir slandered Hasan for stealing his watch (he put the the watch under Hasan’s pillow) and demanded that Hasan to be cast away from his house!! Amir, the Pashtun rich brat! Oh, well…he finally learned his lesson the hard way. My heart went to Hasan, a boy born with a cleft (but Amir’s father paid for a surgery to get it fix) but with heart of gold. Although he was always ridiculed by Amir, he didn’t retaliate. Amir always teased Hasan for being illiterate but the naive boy’s affection to Amir never wavered. 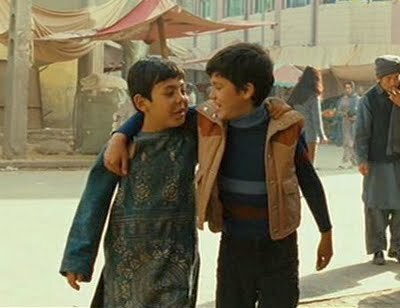 But I have to say that the MOST GRIPPING PART came when Hasan was running to collect Amir’s kite, he was cornered by teenager Assef and the other bullies in the neighborhood who wanted to take revenge. 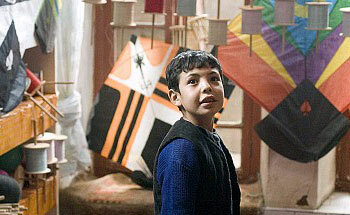 Assef demanded the kite but Hasan refused to let it go. So, Hasan was beaten up and, SODOMIZED by the psychopath Assef. Amir SAW EVERYTHING from a hiding place but WAS TOO COWARD TO DO ANYTHING!!!!!!!!!!!!!!! After the incident, Amir pretended to bump into Hasan and asked about his kite. Hasan DID NOT SAID anything although there were blood stain from his rear end. Amir paid no heed on that. MY GOD, I WAS REALLY PISSED OFF WITH AMIR (although it was just a character!). You guys can laugh but I admit I was really angry when I read this part. I wished I could have slapped Amir at that point of time! Hasan, the Hazara boy with a cleft. Sadden by the pain he has to endure. My heart stopped when I learned that Hasan was shot to death by the Taliban along with his wife, Farzana when they were accused of dwelling at a residence that was not theirs (when actually, they were taking care of Amir’s residence who migrated to America). The loyalty never wavered. AND I felt as if someone thrust a knife into my heart (I am not trying to sound exaggerate or what; that was what I really felt) when I learned that Hasan was actually Amir’s ILLEGITIMATE half brother!!!! And when Amir travelled back to Afghanistan from American to find Hasan’s son, Sohrab, he finally found that Sohrab was also RAPED by Assef who was one of the Talibans!! 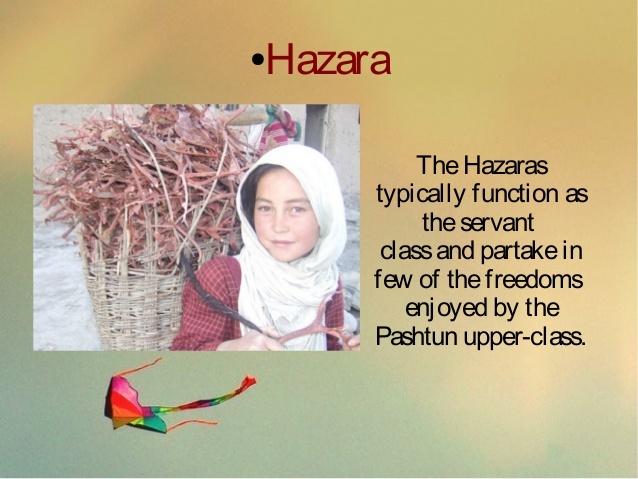 A good description about The Hazara. 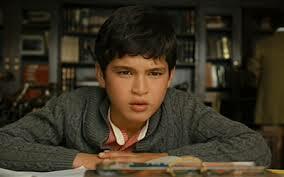 I really felt for the character Hasan. Being a Hazara and an illegitimate child, he experienced a lot of pains. I guess some of you may laugh when I write this (“Hey, it’s just a fiction!) but you have to bear in mind, this is a reflection of the reality. It is possible that there are tonnes of Afghan kids that are experiencing the same life paths like what Hasan was. And the novel also was bold enough to expose the sexual abuse towards male children during the wartime. You know. during wartime, anything that is ‘fuckable’ (sorry if I use that word) will do for these horny soldiers! But of course apart from the heart-wrenching elements, I was also drawn to the setting of Afghanistan depicted in the novel. We only knew the barren Afghanistan with its Taliban regiment but way before that, Afghanistan was a modern country with its own monarchy and elitists that unabashedly practiced Westernized lifestyles (represented by Amir and the Pashtuns). The quote which is the centre of the plot in “The Kite Runner”. Redemption and repent. This novel also delved into the Islamic rituals and practices through the sequence where Amir who, like his father, was a Moslem but not so observant – they rarely read the Quran and they drink wine and even questioned whether God existed or merely a philosophy. But the ambiguities were restored when he went to Afghanistan dealing with the ghosts of hist past and by God’s grace, able to feel the tranquility in his life for the first time since the day he betrayed Hasan. I guess I could talk about this novel non-stop. I am certainly looking forward to read another books written by Khaled Hosseini. I am very much in awe with his writing. 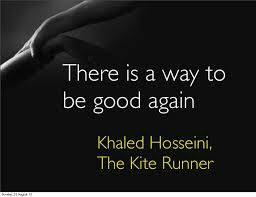 And definitely, “The Kite Runner” is one of the saddest yet best novels I have read in my entire life. God bless. 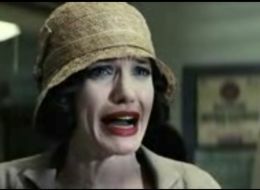 The trailer of the film version. It is overwhelming to see the the characters I read come to life. ← A Crane Collapse @ Gate Of Babussalam, Makkah al-Mukarramah 2015 : The Game Of Blame – The Anger Of Mother Nature? The Negligence Of Capitalist? The Act Of God? A gripping and emotional story of betrayal and redemption, The Kite Runner had me thrilled and moved, both at the same time. 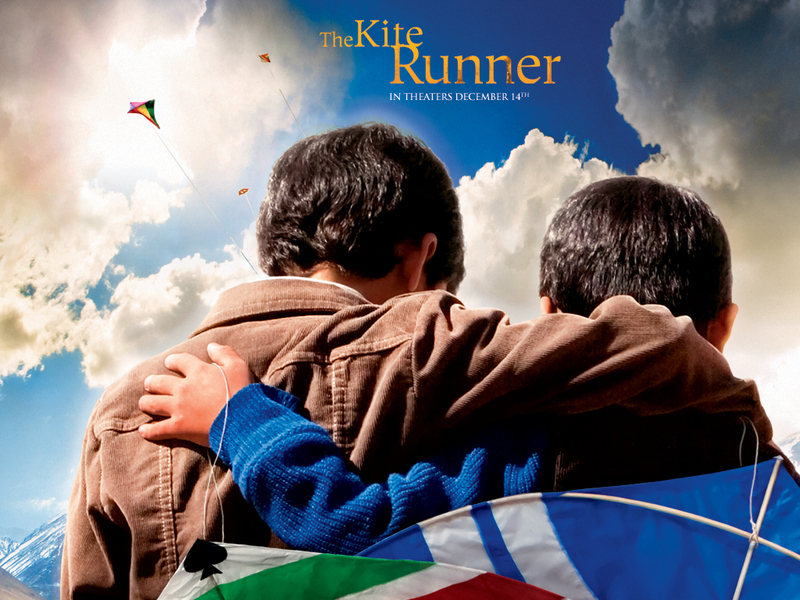 It tells the story of Amir and Hassan, the closest of friends, as good as brothers, and also experts in the art of kite flying. The two young boys live in Kabul, the capital of Afghanistan, and this year they are going to try harder than ever to win the local kite-fighting tournament—a popular Afghan pastime, and this is Amir’s one hope of winning his father’s love. But just like the kites battling in the sky, war comes to Afghanistan, and the country becomes an extremely dangerous place. beautiful and touching story! I love both novel and film! Daryl : I knowwwwwwwwwwwwwwww!!!! One of the best and saddest book I have read! Seriously mind boggling! Kopiah : wah baguslah ye….